TIME, DATE, PLACE: 5 p.m., Tuesday, Oct. 13, Gamble Room, Rush Rhees Library, University of Rochester’s River Campus. ABOUT: The lecture explores how scientific modernity sometimes fostered unexpected forms of religious belief and enchantment. 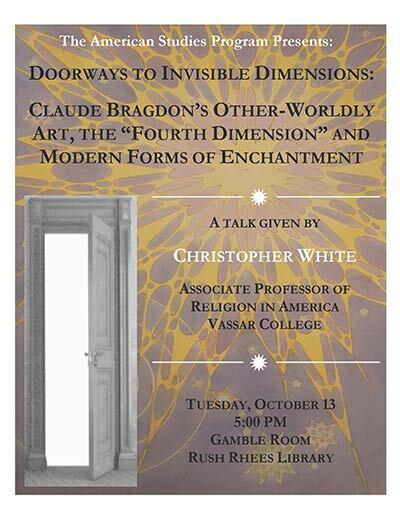 White focuses on the life of the New York architect, artist, and writer Claude Bragdon to show how Bragdon used art and design to recover an imaginative sense for the supernatural and promote his new, enchanted views to wide audiences. ADMISSION: The talk is free and open to the public. SPONSOR: The American Studies Program.